I really enjoyed the writing of Rose when I reviewed Collector of Dying Breaths last year. The Witch of Painted Sorrows is an evocative, lush tale of love, witchcraft and fear. It's the kind of book that stays with you long after you've set it down. 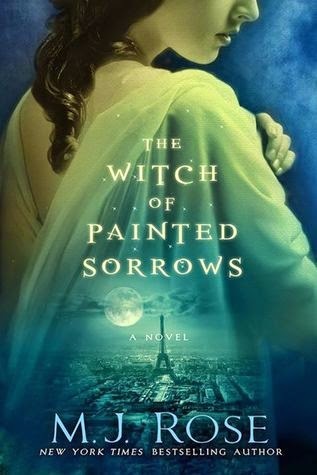 With gorgeous prose that had me wanting to slow down and savour each page, The Witch of Painted Sorrows has enough going on that I had to know what happened next, and next, and next. It's a beautiful, heartbreaking story with a gorgeously developed sense of foreboding. Set in 1890s Paris, the star location here is Sandrine's grandmother's mansion. This house has been in the family for generations and the secrets it harbours are life-changing, to say the least. I loved that the house itself was basically a character in the novel, drawing Sandrine in, nudging her along her journey with each secret the house revealed. Houses like this one are one of the reasons I'd love to do a proper European tour - to stand in homes where so many have stood before and just breathe it all in. Where the vocabulary of The Collector of Dying Breaths was informed by that book's focus on perfumes, The Witch of Painted Sorrows emphasizes the visual, particularly colour, as befits the significance of painting in the story. The language in this book is so rich, I could have happily feasted on it without the need for a complex, deep story. Happily, the book doesn't rest easy with a superficial story. Oh no, this one has a dark, occult tale of possession, passion and love. The story is twisty and relentless. And I don't want to spoil anything, so that's all I'm saying! Sandrine's transformation across the story had me wanting to go back to the first pages after I reached the end, to remind myself of how far she had come from those initial moments of the book. The complexity of the story, with Sandrine as a narrator who is not always the most reliable narrator, makes her development particularly interesting. I'll certainly be coming back to this series as I can see so many different directions that it could and I need to know where it goes! The Witch of Painted Sorrows is a lovely, rich, complex story that I wanted to both savor and race through to find out how it would all turn out! I absolutely recommend this one, and I also think it would make an excellent book club book!